My little monkey surprised me tonight. I grabbed her for some quick pics of bean snappin’ and she in turn showed me that she can snap beans like a pro! Mommy score. Anyone who freezes or cans beans knows how much work goes into all that snappin’. When I was little, I can even remember breaking fake “beans” in the fall with Grandma. Anyhoo, we will be canning Add’s mess of beans tomorrow, but we froze a batch a couple weeks ago that turned out quite nice. I have a feelin’ this month’s FREEZE-O-RAMA is going to be limited to grill marinades and garden canning and freezing… And that is a GOODe thing in my book 🙂 I just heart summer. 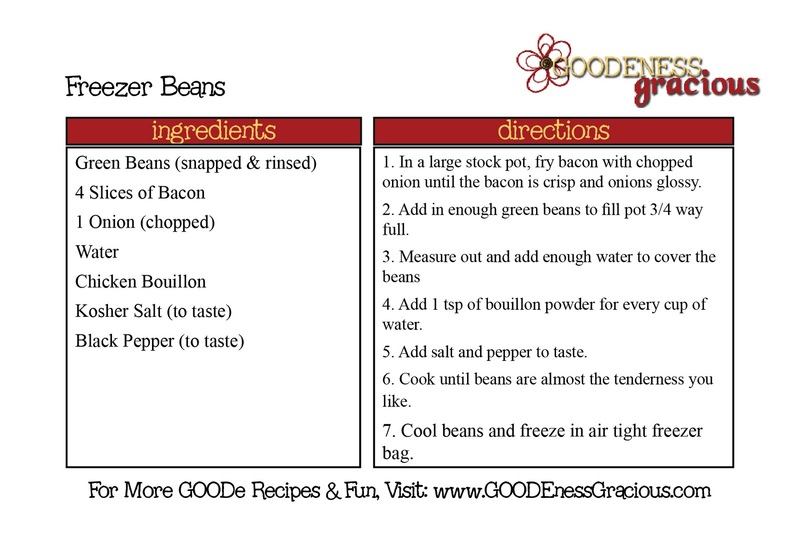 I started out with several slices of bacon and one chopped onion (per stock pot of beans). Anyhoo… while my inferior bacon was cooking, I rinsed my freshly snapped beans in the sink. Once my bacon and onions were mostly cooked up, I tossed in enough beans to fill the pot about 3/4 the way full. I then added enough water to cover my beans. Then a tad bit of Kosher salt and plenty of fresh cracked black pepper. Put a lid on it and cooked the beans for a couple hours until they were almost super tender… since I was planning on freezing these I didn’t want to overcook them before hand. Up next… figuring out what to do with these puppies and canning my next mess of beans. Did I mention that I heart summer (and our garden)? I love wholesome and homemade…and that huge stockpile of potatoes. YUM!!! We used to have a summer supper of green beans and boiled potatoes. I don't see how turkey bacon will even work with those beans. I should NOT be such a skeptic! I'm sure you won't taste a difference and it will have 1/2 the calories! We’re looking for families to take on the challenge of cooking meals together each week and sharing their experiences on their blogs. If you’re interested in getting involved, please email me at TheKidsCookMonday@gmail.com. Thanks! Love the adorable pics of your daughter snapping beans!!! And also love the brilliant green of the beans. I just checked mine tonight in the garden. It looks like I'll be eating fresh beans this weekend and freezing all next week! I still have canned beans from last year. When doing the Freezer Beans…What if I used Chicken broth or stock instead of the Bouillon, I try to stay away from overly salty food items, and Bouillon is not good for your health…Would it still come out good with the broth or stock??? Stock/broth will work just fine. Enjoy!